At first, I was just tired all the time. Really tired, but just tired all the same. Then the joints in my fingers were swollen and sore when I woke up. Pretty quickly, the joint pain and fatigue escalated so much that the mere thought of walking up the stairs to my room brought on tears and a five minute shower had to be followed by a 30 minute nap. I had no idea what was going on. Neither did my doctor. The endless array of tests didn’t bring results, but they came with plenty of disbelieving looks. Looks that said, “Your pain isn’t real. It’s in your head.” It wasn’t. The truth eventually came out — I had lupus. And I had it bad. I didn’t know how to react to the news because I had no idea what lupus was. As one of my friends said, “It’s that thing that they always think patients have on the show House, but they never actually do." That’s the problem with lupus. Most people have at least heard of lupus, but few know any real details about the disease. That lack of understanding makes it difficult to wrap your head around when diagnosed and even more difficult to share that news with others. Over time, I realized that if I want people to have a better understanding of lupus, I need to be willing and able to speak about the disease myself. Fast forward four years and when the chance for Viget to work with the Lupus Foundation of America (LFA) on a pro bono project arose, I was thrilled. Lupus is a mysterious disease and LFA is a national organization devoted to solving that mystery — while improving the quality of life for all people affected by lupus through research, education, support, and advocacy. Along with a series of nationally televised public service announcements, LFA wanted to launch an interactive website that would help educate the public about this mysterious disease. The campaign is based around the idea that in order to create a future with NO LUPUS, the public first needs to KNOW LUPUS. We were able to partner with them to create a campaign site that helps increase awareness about lupus, educates the general population, and raises money to support research. Naturally, this was a project I was personally invested in, but my colleagues were very engaged in the mission, too. Viget’s founders, Brian and Andy, like to support worthy causes to which we are personally connected and they were happy to lend a helping hand to LFA. A team of folks including Blair Culbreth, Doug Avery, Ally Fouts, Anjali McKenzie, Ben Travis, Mike Ackerman, Kevin Powers, and myself all pitched in to make the project happen. 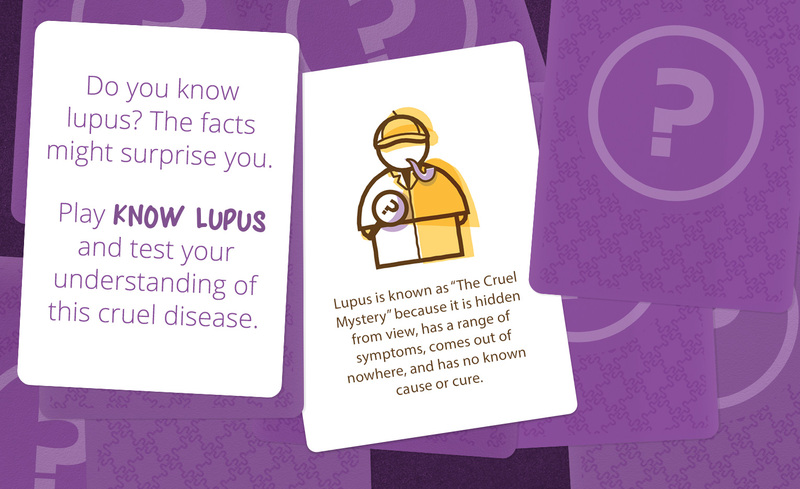 We created an educational, yet fun, card game, built using React, that lets site visitors learn interesting facts about lupus while encouraging sharing. As they play the game, we keep track of game completions. Each time the game is completed, a partner makes a donation to lupus research. Visit lupus.org/know to play the game for yourself and help out the cause. For more details on our work, visit our case study.